At a café called Ratio in Shanghai, a revolving, jointed robot arm with two fingerlike prongs knows just how you like your latte. That’s because customers can order via a mini-app on social media platform WeChat, specifying the level of sweetness and choosing between coffee beans. Plus, because it syncs with your social media profile, the barista never spells your name wrong. Robots in restaurants sound like a futuristic novelty. But in China, kitchen-side automation has long been routine for some restaurants, fast food chains, and cafeterias. What’s more, robotics are being used to standardize a centuries-old cuisine, potentially shaping the taste buds of future generations. They also provide an attraction for curious crowds. At Ratio, founder Gavin Pathross told TechNode at a conference last November, many customers are lured in at first by the robotic barista, which also mixes cocktails. But customization, menu items and enhanced service keep them coming back. “Once you get past the novelty, then its service sells itself,” he said. It helps that the robotic arm, while reducing the labor costs for the café, is supplemented by human staff who can answer questions and interact with customers. Other attempts at robot-serviced restaurants in China have previously fallen short. In 2016, Workers’ Daily reported that a Guangzhou restaurant chain had replaced its robotic servers due to technical issues—namely, they were prone to spilling things and unable to avoid collisions. A hotpot restaurant in the same city also attempted to address a staff shortage with hardware, only to shut down in the end. In 2018, companies including Alibaba’s grocery chain Hema and JD.com captured public attention by using service robots. At Hema’s Robot.He, located in the Shanghai suburb of Nanxiang, boxy little machines deliver dishes to customers, while JD’s XCafe in Tianjin requires only a skeleton staff of five or six humans to restock and position ingredients. The company’s core product is essentially an automated vending machine that creates and dispenses meals on demand. While manufacturing tests are still underway, the company is close to finishing its second round of funding. Stanish envisions deploying the machines in “hundreds of retail locations” across Macau, Hong Kong, and southern Guangdong province by the end of 2020. For years, other companies have been quietly manufacturing machines that chop and cook ingredients. While their efforts may not seem as futuristic, they have paved the way for the age of automated food preparation. 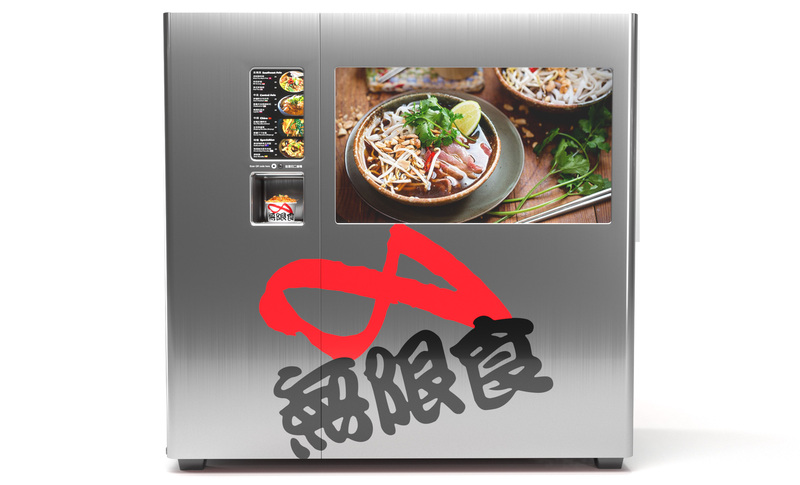 Shenzhen-based Hongbo Zhicheng Technology, for instance, makes “stir-frying robots”—essentially mechanized woks—and other kitchen equipment for customers such as Haidilao, the popular hotpot chain that went public last fall, and the Japanese fast food franchise Ajisen Ramen. It also supplies cafeterias in companies, schools, and military settings. But Hongbo does more than manufacture machines. It has also developed a Chinese cuisine research lab, as well as a digital database of recipes for hundreds of popular dishes. Combined, they represent a standardization of Chinese food preparation, which can vary widely depending on the region as well as the chef. The case of shredded pork with garlic sauce is an example of how this transpires, the company’s executive director Zeng Zhicheng told Technode. In comparing some 10 variations, company researchers consulted well-known chefs or experts to determine the most commonly recognized one. That version went into the database, and can be used and tweaked by Hongbo customers as they see fit. He believes that automation can bring much-needed changes to the “crowded” food and beverage industry, raising the quality of dishes and making restaurants easier to manage. As the field “industrializes” and standardizes, customer experience will become more personalized, not less. Zeng compared the situation to the garment industry. He might be wearing mass-produced clothing, he said, pointing at his checkered shirt. But because he’s unlikely to bump into someone wearing the exact same shirt, it still feels unique. Hongbo Zhicheng belongs to a subgroup of the Standardization Administration of China that specially oversees food-related service robots. According to Zeng, the group creates and releases standards for the industry, part of a government emphasis on the field in recent years. According to a 2018 assessment by the Chinese Industry of Electronics, while food and catering startups using automation are still in the early stages of funding, the industry as a whole shows great potential for growth. That’s taking place amidst sunny growth in China’s robot service field in general. Two years after a Robotics Industry Development plan was released, analysis firm ResearchInChina predicted the field would grow 20% each year, reaching a total $4.9 billion in 2022. In the case of food preparation, automation could be a boon for more than just cutting costs. Food safety has long been a concern for consumers, from 2008’s melamine-tainted infant formula scandal to various reports of contaminated cooking oil. Chinese tech companies have attempted to address these issues with the help of blockchain and AI, including the unforgettable development of facial recognition for pigs. Introducing standardized recipes and preparation methods, as well as automated cooking, could help restore consumer trust. But as adoption grows, startups may also face resistance from customers.